His soul is still dancing. Bad Lieutenant (notably a prefix that only later attached to the project as a nod to the unrelated to 1992 film of the same name) marks one of Nicolas Cage’s strongest performances of recent years, yet the film itself becomes a parody as it lurches between moments of lucid inspiration and a chaotic mess. 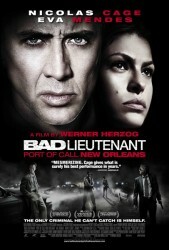 Set in a post-Hurricane Katrina New Orleans, the film opens with virtually no setup as we see good cop Terrance McDonagh [Nicolas Cage] injured as he attempts to rescue a drowning prisoner. The accident leaves him in permanent back pain, and he begins to supplement his pain management regime with narcotics. We follow his investigation of the murder of five Senegalese immigrants, while he struggles to balance his life with Frankie [Eva Mendes], his prostitute girlfriend, and mounting gambling debts. His actions gradually become more extreme as he becomes more frantic and delusional. Herzog has a skill in drawing deranged performances from his leads, and Cage’s descent into amorality is incredibly compelling to view. His committed performance is very physical: his twisted gait and slumped shoulder conveying as much pain as his face. Unfortunately it rather peaks too early, with his fall complete by about halfway through. At this point Cage’s scenery-chewing insanity will alienate many viewers as ridiculous, although it was clearly a stylistic choice. The same will be true of the contrived closing which feels so bizarre I was convinced it was a dream sequence. There is surely an element of satire but it feels lost, and cheapens what came before. The other problem is that the duller police procedural elements of the film are clearly not the focus, yet we return to the investigation too often, merely to push forward a story about which we do not care. 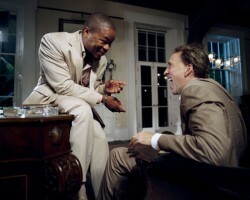 Misplaced time stretches to the supporting cast: Val Kilmer as Terrence’s partner is largely unused while Big Fate [Xzibit] doesn’t make a particularly impressive villain, due more to the script than the performance. Of course matching a maniacal Cage would be a tall order. Mendes has more screen time and does adequately in evoking sympathy for an ultimately clichéd character. Expect polarised reviews because ultimately the film is either a brave work of insane genius or a mediocre mess of interesting but undeveloped ideas. Unfortunately I am inclined towards the latter.